Flavius Vetranio Augustus was a Roman soldier and statesman, a native of the province of Moesia (in modern Serbia). He was briefly Augustus of the Roman Empire between the 1. March – 25. December 350. 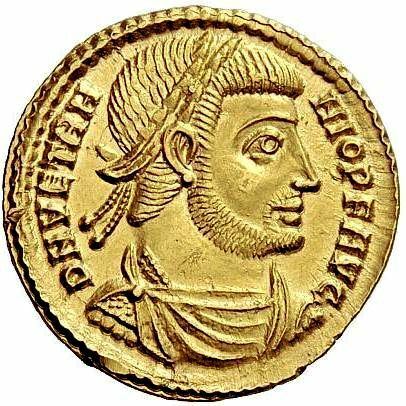 He was asked by Constantina, the sister of Roman Emperor Constantius II, to proclaim himself Emperor. Her brother Constans had been killed by Magnentius earlier that year and she probably thought Vetranio could protect her family and herself against the usurper. Vetranio accepted, and coins were minted in his name. When Constantius II returned from the East to deal with the usurper, Vetranio willingly surrendered the purple to him. He was allowed to live the remainder of his years as a private citizen on a state pension.